Seeking the best combination of detailed maps and value for your Moab trip, then get our bundle pack. It includes both our Moab North (#500) and Moab South (#501) map, providing you coverage of the entire map region, while saving you over 15%. 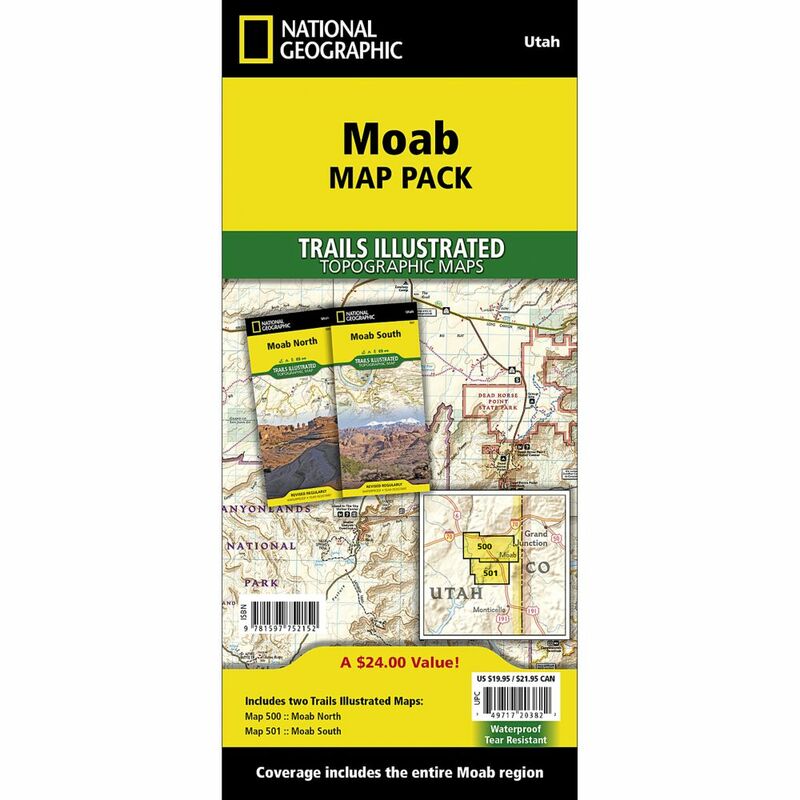 Like all Trails Illustrated maps, the Moab Bundle set is frequently revised and printed on waterproof, tear-resistant material to stand up to all conditions. Includes UTM grids for use with your GPS unit. This National Geographic -Trails Illustrated™ topographic map is the most comprehensive and complete recreational map for the recreation areas north of Moab, Utah. The map shows all trails, campsites, and recreational features, plus ratings and mileage for mountain biking trails and junction-to-junction road and trail mileage. Coverage area includes Green River, Fisher Towers and Arches National Park; highlighted Jeep Safari Trails and Mountain Bike Trails from Moab to Interstate 70; enhanced coverage of Dubinsky Wash to the Green River. Includes detailed 1:35,000 scale insets of Moab, Slickrock Bike Trail, Sand Flats Recreation Area, and Monitor and Merrimac Buttes/Bartlett Wash Area. All data is updated to reflect road closings, new trails, and campground relocation. Printed on waterproof, tear-resistant material with a plastic coating that offers supreme durability for your next outdoor adventure. Scale = 1:70,000. This National Geographic -Trails Illustrated™ topographic map is the most comprehensive and complete recreational map for the areas south of Moab, Utah. The map shows all trails, campsites, and recreational features, plus ratings and mileage for mountain biking trails and junction-to-junction road and trail mileage. Coverage area includes Moab, Dead Horse Point State Park, Behind the Rocks WSA, Hurrah Pass and Canyonland's White Rim; highlighted Jeep Safari Trails from Moab to Canyon Rims Recreation Area; and detailed 1:35,000 scale insets of Moab, Moab Rim, Poison Spider Mesa, Gold Bar Rim, and Gemini Bridges Area.